Aizawl, May 20 : David Zohmangaiha (38) s/o K Zokhuma (L) has become the first Mizo to scale the highest mountain in the world, the Mount Everest. He, along with team members, set foot on the mountain peak at 5:30 am on Saturday. Vanlalliana, Maubawk, Head Adventure of Sports & Youth Services department of Mizoram was also in the expedition team as Base Camp Manager. Meanwhile, three persons of the team could not reach the peak due to physical problems. Family of David exclaimed, "We are very happy and we are also very proud of him. In the beginning we were almost disheartened as a huge amount to the tune of lakhs of rupees was required for the expedition as it was a bit difficult to get sponsored because no Mizo has yet scale the Mt. Everest before. So, while we were almost losing heart, David had not only achieved his goal but won our hearts." The expedition team, which set out to scale the Mt. Everest on April 5, 2013, reached Camp IV, the last stage before reaching the peak which is of 7920 metres ( 26,000 feet) high on the night of May 16 around 10 pm. and from there they proceeded upward to reach the peak measuring 8848 metres (feet 29,029) the following day. Sources said they had to stop for some time when they reached 'South Col’ which is near Camp IV, as speedy wind of 60 kilometre per hour blew along and also because of the snowfall. Also, even after 3 of the team members reached the peak, the other members had to stop at 'South Col’ due to lack of oxygen and food. They started again on Friday night, and the other five climbers reached the peak in the morning yesterday. The expedition conducted under the aegis of Manipur Mountaineering & Trekking Association was sponsored by North Eastern Council. Sources also informed that Vanlalliana’s contribution for the success of the expedition is immense, citing that after when the team doctor faced physical problem, he even helped in taking care of the members’ physical condition. In order to scale the Mt. Everest it is required to secure Grade ‘A’ in each of Adventure Courses, Basic Mountaineering, Advance Mountaineering and Search & Rescue. After these, it is necessary to scale at least one minor peak and one major peak, of a height 20, 000 feet and 22, 000 feet respectively. 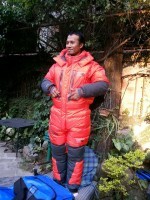 Even after fulfilling all these requirements, it is further required to undergo Pre-Expedition for Major Peak. In terms of logistics too, advance booking' and a total amount required by one person is Rs. 18 lakh. The team members from Mizoram were sponsored by Sports & Youth Services department besides DRDA Project Director, Rotluanga and D3 Business Enterprise, Ramhlun North. Starting on April 5, 2013 from New Base Camp, 8 of the expedition team members scaled the mountain peak during May 17-18. They will leave New Base Camp on May 22 and proceed to New Delhi. David Zohmangaiha, the first from Mizoram to set foot on the peak of the Mt. Everest, is the present leader of Silver Hawk Adventure Club, Republic Veng, Aizawl. His club Silver Hawk Adventure Club had during 2006-2010 ventured to all the Mizoram boundaries. Record has it that one Mizo identified as Capt. Samuel Lalrintluanga (Indian Army), employed at Medical Office of Nehru Institute of Mountaineering, Uttarkasi, Uttaranchal State had earlier participated as Team Leader of Mt. Everest Joint Expedition under the aegis of Nehru Institute of Mountaineering and Indian Mountaineering Foundation (IMF). The team had scaled the Mt. Everest on May 21, 2009. Although Samuel Lalrintluanga was the first Mizo to participate in the team of expedition to scale the Mt. Everest, but due to certain problems, he failed to book his name among the team members who had reached the mountain peak. Also in 1995, Mizoram Alpine Club had climbed Mt. Abigabin (24, 639 feet) on behalf of Mizoram Adventure Association (MAA), but after being qualified for expedition to scale the Mt. Everest, they could not do so due to financial problem. But then, as they were already qualified earlier, they opened up the way for Adventure Club which is under MAA. It may be recalled that Sir Edmund Hillary, Auckland, New Zealand and Sherpa Tenzing Norgay, Nepal were the first to scale Mt. Everest, the highest mountain in the world.